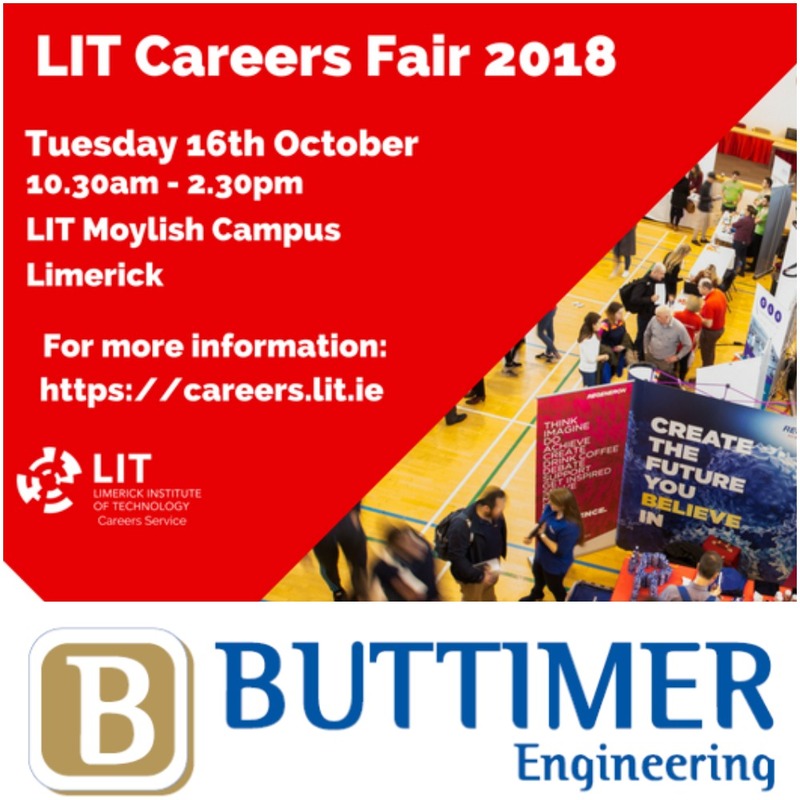 Buttimer Engineering will be attending the LIT Careers Fair 2018 next Tuesday, October 16th. Feel free to stop by for a chat and to see what Buttimer Engineering can offer you! Buttimer Engineering are delighted to announce our sponsorship of the 2nd annual Association of Bulk Terminal Operators conference. This years event is taking place in Hamburg from Tuesday 23rd - Wednesday 24th of October 2018, and is following on from the success of the inaugural conference in London last year, which featured a number of high level speakers and guests from all sectors of industry and government. The primary goal of the ABTO conference is to bring together all those involved in the transportation, storage and handling of bulk commodities. Given that Bulk Terminal Operations are an increasingly pivotal aspect of our business, largely attributed to the development of our DOCKSOLID brand, this event is an ideal opportunity to meet, network and learn from like minded individuals in the Bulk Terminal sector. Buttimer Polska Sp. z o. o. were delighted to receive a ministerial visit to our office in Warsaw, Poland, this week. Amongst those present was Irish Ambassador Gerard Keown, Minister Pat Breen T.D, Tom Kelly and Adam Jaszczur, both of Enterprise Ireland. 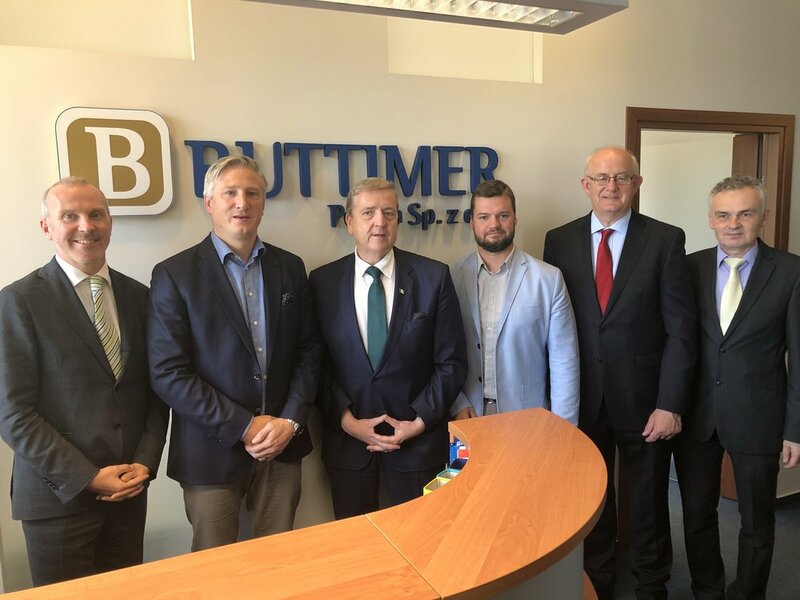 The excellent relationship between Ireland and Poland has proven to be a be a pivotal part of Buttimer’s growth in recent years. Since our Polish office opened first opened in 2005, we have seen promising year on year growth in the Polish market, so this was a great opportunity to show some very influential people the great work being done here. We would like to thank everyone who took their time out to see us and we hope they thoroughly enjoyed their visit. In less than a months' time, Buttimer Engineering will be travelling to Rotterdam, the Netherlands, to exhibit at the renowned TOC Europe event, where we will be showcasing our patented DOCKSOLID materials handling technology. TOC Europe is widely considered to be the global meeting place for ports, terminals, shipping lines, 3PLs and shippers, providing key figures in the industry the opportunity to learn, debate and network. Since the launch of our DOCKSOLID brand in 2014, supplying state-of-the-art port equipment has become a cornerstone of the business, meaning this event is the ideal opportunity to show why DOCKSOLID is held in such high regard. We were present at the 2017 version of the event which was an undoubted success, for ourselves as a company but also as an event in general. For those attending this year, you will find Buttimer Engineering and DOCKSOLID at stand C116 so feel free to pop in and learn more about what makes us one of Irelands most successful port equipment suppliers. If you would like to arrange a meeting in advance don't hesitate to drop us an email info@buttimer.ie. Buttimer Engineering are currently seeking applicants for the role of Sales and Business Development Director. This is a pivotal role within the company and so will involve an extensive Mechanical Engineering/Manufacturing brief. Reporting to the Chief Operating Officer, the successful candidate will be required to maintain and develop Buttimer’s existing domestic market as well as pursue and grow new international markets. DOCKSOLID is proud to have been nominated once again in the Best Ship Loading/Unloading System category at the International Bulk Journal Awards, a category it won in 2015. DOCKSOLID faces stiff competition this year as it nominated alongside Neuero (Germany),Siwertell/Peel Ports, (Sweden/United Kingdom), Seram, (France) and Vigan(Belgium). DOCKSOLID is nominated for it's new range of Standard Hoppers, the first of which was delivered to the Port of Cork this year. The winners will be announced at the awards night to be held in the Tower of London on November 21st. Buttimer Engineering has completed it's project at the Port of Liverpool where it was installing a a bespoke system for Biomass handling, including conveyance systems between ship unloaders, storage silo’s and rail carriage loading systems. First shipments from the facility began in late 2015 and phase 2 of the project has been in progress since then to bring the facility to full operation. Buttimer Engineering has completed the first stage of work on the new Biomass Facility in the Port of Liverpool, where the project includes the installation of the biomass materials intake, handling system and support steelworks. The Port of Liverpool is now officially part of the biggest ever carbon saving project in Europe as a new hundred million pound terminal celebrates its first full day of shipments of sustainable biomass pellets bound for the Drax Power Station in Selby.